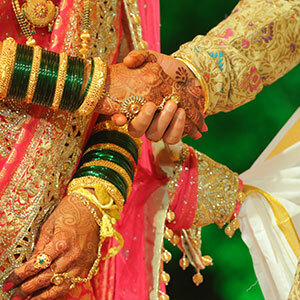 Marriage is a divine unison of soul mates and is a vital decision one makes in life. The secret of a happy marriage is finding the right person. Especially, in today’s digital world, finding your perfect match has become quite a challenging task. Vedic Astrology says that there are several factors influencing your marriage life and compatibility between the couple. 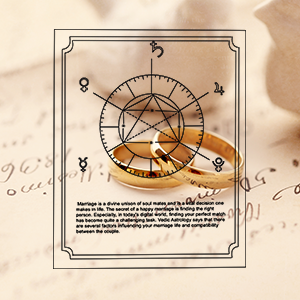 The planetary positions in one’s birth chart decide the time of marriage and how life unfolds after marriage. How successful will my marriage life be? AstroVed have helped many find the love of their life with the help of Vedic astrology. Under, Marriage Astrology, we offer various services like horoscope matching between the bride and the groom (Kundali matching), astrology consultation to analyze birth chart to find Manglik or Sarpa doshas and love & romance compatibility. Our astrologers do not just stop with the evaluation of your birth chart for relevant relationship information. They also suggest powerful Vedic remedies targeted to bring you relief from delays in marriage or a troubled married life. We help you forecast the chances of success of a married life, whether to move on or cling on to an existing relationship and guide you to make your married life a success. Our panel of skilled astrologers devises horoscope matching and romance compatibility reports by analyzing the birth charts of the couple in detail. Upon studying the horoscopes of a man and a woman for marriage, 36 key points are considered. For marriage talks to precede further the would-be couple must match 18 key points or more for a successful marriage. Our trained astrologers carefully evaluate birth charts to identify reasons for marriage and relationship woes. Our astrologers do not just stop with the evaluation of your birth chart for relevant relationship information. They also suggest powerful Vedic remedies targeted to bring you relief. Nadi Astrology can help you find answers to relationship issues that have been bugging you for so long. Identify the correct, effective remedies to eradicate any difficult energies or challenging complexities of married life that keep you stuck and stagnant. Betel leaf astrology taps into the cosmic time window surrounding you and your interaction with the betel leaves to reveal deeply insightful solutions to your Marriage and its related problems. Get helpful answers to seemingly unanswerable questions. We invite you to experience the power of amazingly effective Vedic remedies in the form of Homas (Fire Ceremonies, also sometimes called Fire Labs) and Poojas. Doing targeted remedies after examination of your planetary influences can help you solve marriage related problems. Illuminate your hidden love and resolve the dissolving loving relation with the lantern of divine products to cherish a fulfilling life. Each product holds its own unique divine quality which can bring a positive change in building relationships. In case of a male horoscope, the position and aspects of the Moon is considered very important and for a female horoscope, position of the Sun is chiefly considered to study the compatibility among the couple. The position of these two luminary bodies in one’s birth chart connotes a harmonious marriage life. As the saying goes: “Men are from Mars; Women are from Venus”, these two planets and their positions in the natal chart contribute majorly to a blissful relationship. The benefic positions of Venus and Mars increase the chances of a successful and committed wedded life. These relationship planets can bring about a timely and joyful marriage in one’s life. However, if Venus and Mars are weak in a chart or receive troublesome influences from other planets, they can wreak havoc by triggering energies that destroy relationships or give ongoing marriage troubles. Your birth chart can predict the timing of your marriage, how long will you be married and also whether you will be married or not. While certain planetary positions favor marriage, few placements also delay marriage. Therefore, by studying the planetary positions, planetary aspects and their influences in one’s horoscope, different, the nature, timing and events of your married life can be predicted. Marriage astrology also answers several questions about marriage like: When will I get married? Will my partner be rich or not? How successful will my wedded life be? What are the chances of second marriage? And so on.